Long before wine grapes and hops were cultivated in Michigan, apples were not only a staple fruit, but an industry that is now ranked third in the country for production. 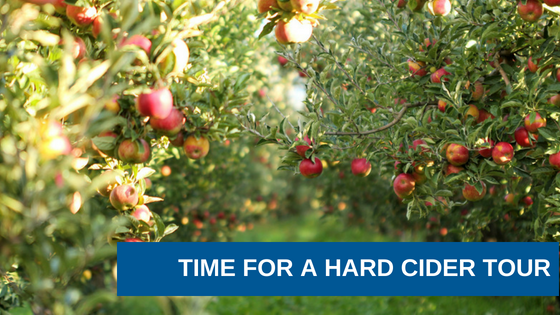 The true history of hard cider dates back to 55 B.C. when the Romans invaded the British Isles and found the residents drinking hard cider (instead of the often-deadly water available). Eventually, hard cider came to the U.S. and was known as the beverage of choice among many Americans, including John Adams, Thomas Jefferson, and the rest of our forefathers. So, it should come as no surprise that cideries, like craft breweries, are popping up all over the state, some with breweries, some with wineries, and some standing on their own. If your group enjoys tipping and tasting, here are some ideas for tours around the state. Starting out in Northville is Parmenter’s Cider Mill, a fixture since 1873. They offer all the usual apple products in a fitting big red barn. Next, head over to Lake Orion for a visit to Fourth Coast Cider Works Tavern (open Friday and Saturday evenings) to try their two unique cider lines and offer feedback as they experiment with new ciders. Head south and you’ll hit Ferndale, home to B. Nektar, producers of mead, cider and beer. Try the taproom for flights of some of Michigan’s best honey-based beverages. Cellarman’s, crafters of mead, cider and beer is only a mile away. Housed in an old lumberyard, it’s an intriguing place to visit, sample and enjoy a beverage made with real Michigan honey. Now you’ll want to head into the “D” and spend some time at Motor City Brewing Works. Enjoy their Cass Farm Series Hard Cider, or maybe a hot spiced cider with brandy, cinnamon, nutmeg, orange rind, and fresh ginger. Yum! For one more wonderful stop, try J. Trees Cellars Cidery & Winery in Tecumseh for cider and wine that is “Grown in Michigan, Made in Michigan.” Their tasting room in the historic Hayden-Ford Mill offers beverages and food so it’s a great place to wrap up your tour. This side of Michigan is part of the fruit belt and, as a result, is home to many wineries, breweries and cideries, some old and others new. First on the list is Texas Corners Brewing Company in Kalamazoo’s Texas Township. This family run brewery, cidery and restaurant is a great place to spend a little time trying the ciders and sampling the full-service menu. Ingredients come from local producers with vegan and gluten-free options available. Onward to Corey Lake Orchards in Three Rivers, where both hard and semi-hard ciders are made with a variety of fruits including peaches, pears, hops, cherries, blueberries and strawberries. They even have a cider made with “hand-sliced ancho, guajillo, and pasa negra peppers.” Moving northwest toward Lake Michigan is McIntosh Cellars in beautiful South Haven. This company focuses on “the creation of Traditional Olde World Style Hard Cider, and iced apple aperitif,” so you won’t want to miss out on this very special brew. Just up the coast is Saugatuck Brewing Co. in, you guessed it, Saugatuck! The Pub there has an extensive menu, as well as cider and 16 rotating taps. When you’re ready to bid farewell to the lakeshore, jog east a few miles to enjoy all that Fennville has to offer, starting with wine and cider at Fenn Valley Winery and vineyard, moving on to Virtue Cider where you can enjoy a tasting room, bottle shop and farm market, and Crane’s Pie Pantry Restaurant & Winery, a tradition since 1916. Still heading north, tour the greater Grand Rapids area starting in Hudsonville on the west side, home to Farmhaus Cider Co., crafting unique ciders on a fifth-generation farm started by their great-great grandpa. In the city, you’ll find plenty of options including Thornapple Brewing Company where you can choose from cider, mead, wine or beer; Robinette’s Apple Haus & Winery, a busy venue with great fruity ciders as well as wine, baked goods, jams, and more; Vander Mill, offering an exceptionally diverse lineup of ciders as well as a Monday-through-Saturday menu and Sunday brunch; and The People’s Cider Co., a purveyor of “premium dry cider.” One last stop is in Sparta at Cellar Brewing Company, makers of cider, beer and wine, and offering an appetizer menu to accompany your beverage choice. In the Leelanau Peninsula is 45 North Vineyard & Winery with a choice of cider or wine, a tasting room, and prearranged tours offered June through September. Northeast of Cedar near Lake Leelanau, you’ll find Bel Lago Vineyards & Winery offering Provemont ciders and a wide variety of vino options, and Blustone Vineyards where you can enjoy cider and wine in a lovely tasting room overlooking the vineyards. Near Northport at the tip of the Leelanau Peninsula is Green Bird Organic Cellars, producers of cider, wine, beer, and spirits. In addition, sustainable farmers and brewers offer a tasting room and store. Moving down the east side of the peninsula along the shore of West Grand Traverse Bay are several great stops around historic Suttons Bay. BigLITTLE Wines has just one cider choice, but lots of lovely wines and a tasting room to enjoy. Black Star Farms, although not a cider producer, is a must-see for its pure elegance and exceptional attention to detail in everything from wine and spirits to the inn and restaurant. For the true cider enthusiast, Chateau de Leelanau offers cider varieties that will please the pickiest palette and you can take a pint or growler with you when you’re finished at the tasting bar. Suttons Bay Ciders has a huge cider list and, from its perch on Hilltop Road, the view is absolutely breathtaking. Another stop before you’re done is Tandem Ciders, just north of Suttons Bay, that offers a wonderful variety of ciders as well as an appetizer menu to make your tasting complete. These are just three regions of Michigan with a wealth of cider tasting opportunities and more options can be found at the Michigan Cider Map & Directory. We realize planning a cider tour could get complicated so we are ready to help you make your charter fun, adventurous and easy. Contact us and let us lend a hand!